You have outgrown your shared hosting and you are about to switch to a cloud server or VPS. What naming scheme should you use? If your domain is example.com, what should you put as host name in your VPS setup? Is it www.example.com or example.com or example? Under Configure Server you are required to put in your host name, servername.yourdomain.com. You can put in basically whatever you want. But you should have some kind of naming strategy for your hosts. Even if you only have a single VPS currently, it’s not impossible that your systems will grow over time, or you will split services that were once co-located on a single server onto different servers. You may also want to share your server with someone else or start another website on the same server that is completely unrelated. Basically, the host name should not have any indication of the host’s purpose or function, but instead acts as a permanent, unique identifier to reference a particular piece of resource throughout its life-cycle (do not to reuse names when switching to a new server). This name should be used to label the resource itself and not the sites that will be hosted on it. You should try to pick names that are neutral and not going to conflict with any public names you might want to host in the future. Let’s say you name your server alpha.expireddomains.com and in the future you will share it with a dating blog, Seduction.com, it will just sound awkward. An example would be the use of EC2 or AWS by Amazon. These have nothing to do with the fact that a blog named JohnnyComeLately.com or FixMyTyres.net will be hosted on it. It is also strongly recommended that you put the server names under a domain name that is under your control. It’s not actually a requirement, but doing so will save you from many headaches in the future. Then add whatever names you come up with to that domain name in DNS. The best managed cloud server I have seen is offered by ScalaHosting. Welcome to the 21st century and the future of SSD cloud hosting. By implementing the latest advancements in the web hosting industry, Scala Hosting offers you a new type of SSD cloud server technology which is able to maintain perfect stability at all times. Thanks to their self-healing cloud infrastructure, their servers are capable of performing complex repairing and maintenance tasks automatically. Maximum uptime is guaranteed. Scala Hosting will completely manage your cloud server. They set up, configure, secure and optimize your server. They are responsible for keeping your server healthy and operating normally. You get the control panel developed by Scala Hosting (sPanel) with a graphic interface to manage your cloud server and the all services on it such as website, email, database, ftp and DNS services. 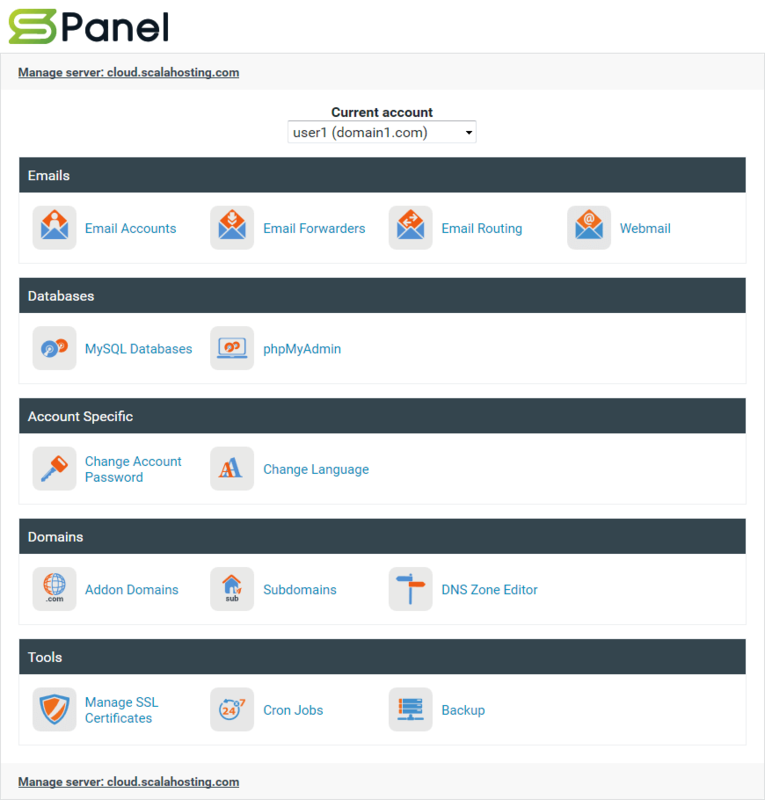 The control panel is compatible with cPanel and will save you $15 per month for a cPanel license. Your websites will work as they have been working on a cPanel server. The control panel is running on Scala Hosting’s own equipment and doesn’t eat from your server’s resources unlike cPanel. The shared hosting model is broken. When a website on a shared server is compromised the hacker uses it to attack and compromise the other websites on the server. It is 100’s of times easier to compromise a website with local access to the server. By isolating your website on its own server you improve its security 100’s of times and help the Internet become a safer place for everyone. When a compromised account on a shared server sends SPAM your IP gets blacklisted. Your emails stop being delivered or delivered to the spam/junk folder. Your server will come with a dedicated IP address which will never get blacklisted and your emails will always reach the recipients. 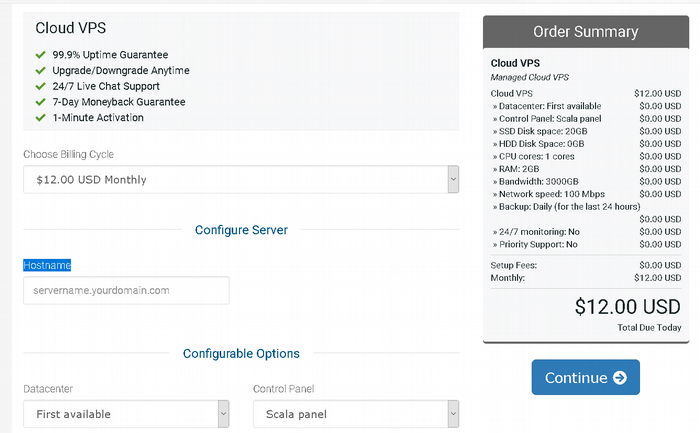 Get your virtual cloud server today with ScalaHosting!